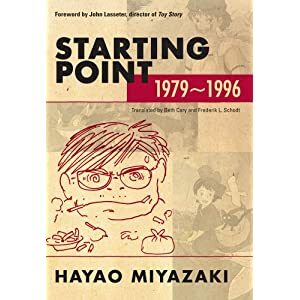 This entry was posted in News and tagged anime books, Hayao Miyazaki, Starting Point by ixarette. Bookmark the permalink. Not really suitable for discussion in the original review in SFX Total Anime, but well worth bringing up here, is the fact that I don’t agree with Miyazaki’s assessment of “the good old days”. He is remembering a period that he was never really part of, and “remembering” it through rose-tinted spectacles. In reading the memoirs of his elders, I have uncovered little evidence of the merry band of animators of the 1940s and 1950s. Instead, I have found tales of crunch times, overwork and compromises little different from those to be found in the TV era post 1963. The production of anime has *always* been a scramble against the clock. That said, Starting Point is still a fantastic book, well deserving of the five stars out of five that I gave it. But I wanted to remind readers of the phenomenological issues of quotes from the horse’s mouth: just because someone was there, doesn’t mean that they had all the facts.